I surprised Brett last night with a little after-work adventure. The boy loves anything to do with the outdoors or getting dirty. He was giddy. It had just rained so the water was a little dirty and quite cold. Needless to say, I was not down with trying it. We’ll go back in a couple weeks when it’s a little warmer and a little less muddy. Video of Brett on Sliding Rock. This entry was posted on Friday, August 8th, 2008 at 10:02 am	and is filed under Brett, Family. You can follow any responses to this entry through the RSS 2.0 feed. You can leave a response, or trackback from your own site. I wanna go! Are you sure that wasn’t Cherry Hill? You guys are really adventurous and a ton of fun. Nice surprise Whitt…I’ll bet you try Niagra Falls next! 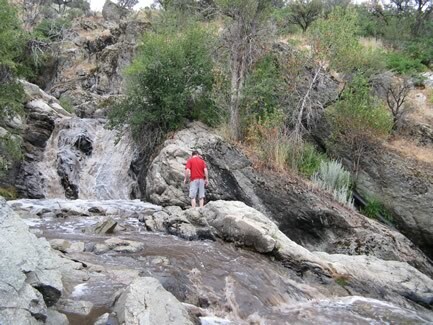 Is sliding rock in Alpine? Anyway I was looking at your pics Whit and you really are such a gorgeous girl…you better remind Brett how lucky he is to have such a catch. Miss you. You guys need a new blog post. Seriously. 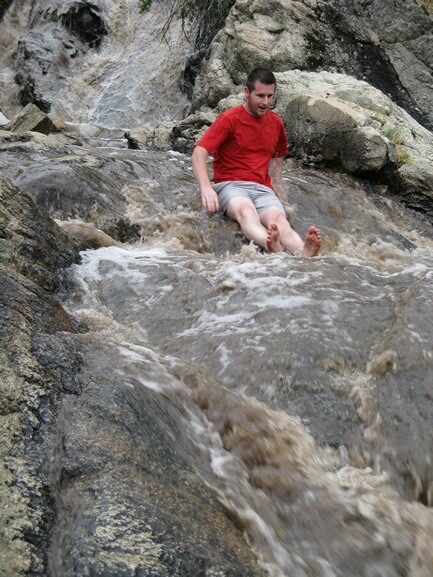 I can only watch Brett slide down rocks so many times. He’s cute…don’t get me wrong.